A beautiful Arts and Crafts Wardle vase probably designed by Frederick Hurten Rhead, Art Director of Wardle's between 1899 and 1902. The textured and gently shaded brown glaze is typical of his known design work for Wardle in this period. 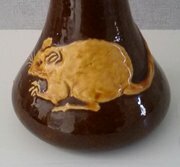 The body is decorated with a mouse in raised cream layers of slip and the tail encircles the neck of the vase. Impressed Wardle England and 5. Height 25cm Condition is generally very good with some crazing to the body of the mouse and visible stilt marks on the base as seen in the last image. 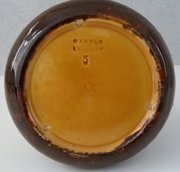 A rare and unusual Arts and Crafts vase.